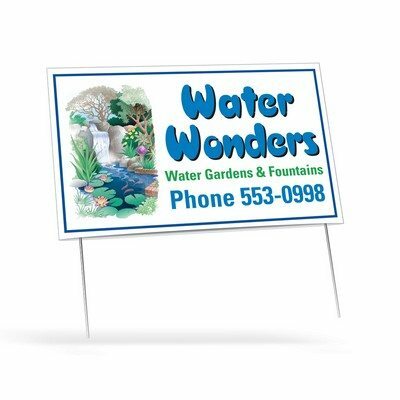 Dimensions: board 16” x 26”; frame 22 1/2" x 34"
You could flag down more potential customers with these imprinted Double Sided Yard Signs. The Yard Sign has good strength and rigidity so you can be sure it will stay in place. The passerby is sure to notice this sign due to its size. These customized two-sided signs give you double the chance to make an impression. Double Sided Yard Signs are great for political campaigns, real estate signage, bandit signs, contractor signs, and business signs. You could imprint your company’s logo and message, and maximize brand outreach with this Double Sided Yard Sign.